For the city in the U.S. state of Indiana, see Brazil, Indiana. 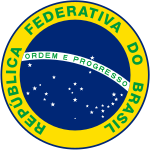 Brazil (officially called Federative Republic of Brazil; how to say: IPA: [bɾɐˈziw]) is a country in South America. It is the world's fifth largest country. The country has about 209 million people. The capital of Brazil is Brasília. Brazil was named after brazilwood. Brazilwood is a tree that once grew very well along the Brazilian coast. The first people to come to Brazil came around 9,000 B.C. That group of people is often called the South American Indians. They probably came from North America. Some of them were hunters and gatherers, but others were farmers. Pedro Álvares Cabral was the first European to see Brazil. He saw it in 1500. He was from Portugal and the Portuguese government claimed Brazil. Soon, explorers explored the whole coastline of Brazil and colonies were set up. In the late 1500s and early 1600s, the Dutch and the French would sometimes try to take land in Brazil. Brazilians started moving inland farther than the Treaty of Tordesillas said they could. This caused some fights with the Spaniards and native people in the area. In 1822, Brazil claimed to be its own country and not a part of Portugal anymore. Soon there was civil war. But the emperor Pedro II improved the economy, and in 1888, he freed the slaves. In 1889, there was a military coup, and Pedro II had to leave the country. In 1889, Brazil became a republic. It was not very democratic, because the only people who could vote were people who owned land. There were some uprisings in the 1920s because some people thought the government was unfairly helping coffee growers. Brazil joined the Allies during World War II. During the 1960s, the leader Castelo Branco made the government like a dictatorship. Since then, the country has become more democratic, but some people feel that there are still big problems in health, education, crime, poverty and social inequality. Most people in Brazil speak Portuguese. Brazil is the only country in South America that speaks Portuguese. Some people in Brazil speak German dialects. That came from German immigrants. 2% of Brazilians speak German as their first language. Yiddish is spoken by the elders of the Jewish community. Other people in Brazil speak their ancestors' languages like Italian, Japanese, Polish, Ukrainian, French, Russian, Lithuanian, Chinese, Dutch and Korean. Spanish or "Portunhol", a mix of Portuguese and Castilian (Spanish) is spoken at some of the borders. Indigenous languages as Guarani and Aymará are the first languages of a small number of Brazilians. Brazil has the world's largest rainforest, the Amazon Rainforest. It makes up 40% of the country's land area. Brazil also has other types of land, including a type of savanna called cerrado, and a dry plant region named caatinga. The most important cities are Brasília (the capital), Belém, Belo Horizonte, Curitiba, Florianópolis, Fortaleza, Goiânia, Manaus, Porto Alegre, Recife, Rio de Janeiro, Salvador, São Paulo (the biggest city) and Vitória. Other cities are at List of largest cities in Brazil. The country is the fifth largest in the world by area. It is known for its many rainforests and jungles. It is next to every country in South America except Chile and Ecuador. 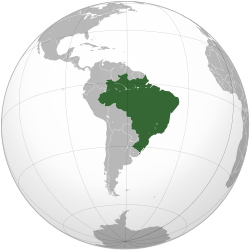 Brazil is the largest country in South America and fifth largest in the world. Its people are called Brazilians or Brasileiros (In Portuguese). The people include citizens of Portuguese or other European descent who mainly live in the South and Southeast, Africans, Native Americans, Arabs, Gypsies and people of Mixed ancestry. Brazil also has the largest Japanese community outside Japan. Other East Asians follow the Japanese group. Two major sporting events were held in Brazil recently: the 2014 FIFA World Cup and the 2016 Summer Olympics in Rio de Janeiro. ↑ "Brazil President Dilma Rousseff removed from office by Senate". BBC. 1 September 2016. Retrieved 30 October 2016. ↑ "The World Factbook". Retrieved 2017-07-11. ↑ "The Human Development Index 2016". Retrieved 2017-07-11. ↑ 8.0 8.1 "Hora Legal Brasileira". Observatório Nacional. Archived from the original on 2011-07-22. Retrieved 2009-02-21. ↑ Boris Fausto (1999). A Concise History of Brazil. Cambridge University Press. p. 9. ISBN 978-0-521-56526-4. ↑ Dr. Brian Fagan; Nadia Durrani. "People of the Earth: An Introduction to World Prehistory". p. 157. Retrieved 10 December 2016. ↑ 11.0 11.1 11.2 11.3 "Brazil". Britannica School. Encyclopaedia Britannica. Retrieved 30 July 2014. ↑ "The 50 largest (area) countries in the world". GeoHive. Retrieved 9 December 2016. ↑ Veselinovic, Milena (July 24, 2013). "Mixing sushi and samba - meet the Japanese Brazilians". CNN. Retrieved 10 December 2016. This page was last changed on 8 February 2019, at 10:13.